Well Triumph have gone and confused things for me. Having negotiated a good price for a Sprint GT with gel seat, heated grips and different levers, I was going to talk turkey about how much to add the top case and a back rest and see what they could do. We have given our popular Sprint GT a special edition makeover in time for the 2013 summer touring season! Our popular mid-range tourer sees a host of new features including heated grips, touring screen, gel seat and top box/back rest pad, all fitted as standard. 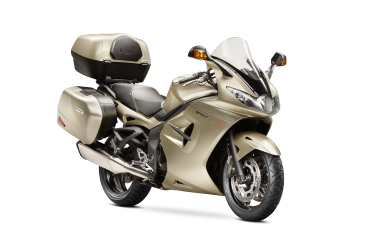 The new special edition model has a cavernous hard luggage carrying capacity of 117 litres, while the upgraded gel seat and touring screen add to all-day comfort, allowing the rider to take full advantage of the 200 plus miles range from a single tank. Powering the new SE model is the 130PS version of our charismatic 1050cc, triple engine, which produces 108Nm of torque, providing effortless overtaking. The new Sprint’s rear shock absorber is easily tuned to suit solo or pillion riding using the hand adjuster located just behind the rider’s leg. The four piston caliper brakes ensure solid and reliable control, with ABS as standard. Other new touches to the Sprint GT SE include stylish Triumph badges on the panniers, a sleek side panel duct finisher and an SE badge on the top yoke to finish off the distinctive look. 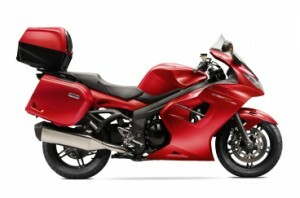 Two new colour schemes – an eye-catching Cranberry Red or a classic Champagne – complete the picture. Available at just £8,999 OTR. Contact your local dealer to arrange a test ride. So yes, that’s the price I was looking at but with the levers. The touring screen could be worthwhile though the standard one looks nicer. Pity about the colours: the champagne is an old man’s colour I think and the red is … red. Never been keen on red cars or bikes. But today I went into Lings Triumph at Watton to see their Cranberry Red one and take a look at how easy it is to remove and refit luggage. And I was pleasantly surprised by the red. Maybe it was as it was inside that the red looked quite classy? Now I like the silver, but… And next week I’m test riding a black one. Decisions, decisions.